Deep-fried foods may be tasty, but they are definitely not healthy. Foods like french fries, onion rings, fried wontons and deep-fried candy bars offer little in the way of nutritional value while putting you at higher risk for certain health conditions. However, you don't necessarily have to give them up totally to have a healthy diet. 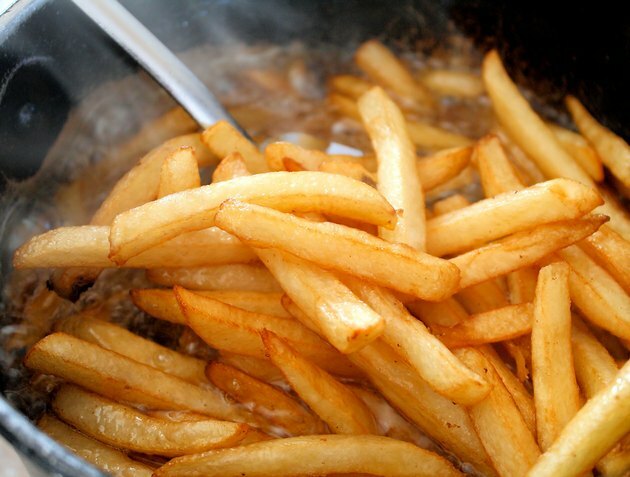 If you can't give up fried foods, you can make them healthier. Use unsaturated oils to fry your foods, such as canola, corn, peanut, safflower, soybean or sunflower oil. Heat the oil to the proper temperature, as oil that isn't hot enough leads to increased fat absorption by the food. Make sure the oil returns to the right temperature in between each batch of food you fry in it. As long as your overall diet is low in fat, saturated fat and trans fat, you can eat deep-fried food in once in a while. Eat just a small amount of deep-fried food, and pair it with healthy foods, such as fruits and vegetables, that are low in calories. In a healthy diet, all foods are OK in moderation.